Edward Harold LaMay, a native of Whitehall, died June 24 of natural causes in Durham, N.C. He was 85 years old. Ed was born in a farmhouse near Whitehall on Nov. 16, 1928, the second child and son of Mabel Hammond LaMay and Joseph Charles LaMay. His first name was given in honor of the doctor who delivered him. Harold, his middle name, simply struck his mother’s fancy. Ed’s older brother, Joseph, served in the U.S. Army engineering corps and in Patton’s 3rd Army during World War II. After returning to Whitehall Joe worked as a guard at Great Meadow prison, teaching art classes to the inmates. He died in 2006. Ed lived an outsized and outside boyhood in Whitehall. Taken with the history and natural beauty of the region, he became an Eagle Scout and, with a beautiful tenor voice, sang in his church choir. He worked around Whitehall in jobs that included delivering newspapers, setting bowling pins, maintaining railroad tracks, and tending to his grandfather’s farm. Ed was also a star athlete at Whitehall High School, where he lettered in football, basketball, baseball and track. In part owing to his athletic ability, Ed was able to attend Union College in Schenectady, N.Y., for which he had a life-long affection. He played football and baseball there, and also ran track. With the help of Union’s president, Dr. Carter Davidson, Ed spent most of his junior year at St. Andrews College in Scotland, where he fell in love with the game of golf. Davidson was so impressed with Ed that he hired him to look after his 16-year-old son Christopher. 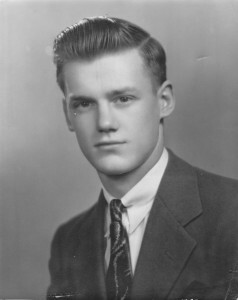 In 1949 Ed went with the Davidson family to their summer home in Frankfort, Mich., where he met Virginia Louise Hill, another summer resident and a student at the University of Nebraska. The two were married during spring break of their senior year, on March 24, 1950, in a ceremony in Rochester, N.Y. Each went back to school to graduate, and then they settled in Schenectady,where Ed had been accepted in General Electric’s executive training program.Ed worked for GE for 41 years, retiring in Louisville, Ky., in 1992. Ed and Ginny were married for 53 years, until Ginny’s death from cancer in 2003. Ed and Ginny are survived by their five children, Teri, Lauren, Craig, Ted and Bronwen, and by four grandchildren, Cassidy and Rory Mullen (children of Ted), Ellis and Owen LaMay (children of Craig).